Congress leaders along with Party President, Rahul Gandhi go full guns blazing over Modi led NDA Government accusing them of the recent CBSE paper leaks. In the wake of CBSE Board Paper leaks, the ruling government is under the scanner. The subsequent paper leak has provided the opposition with another opportunity to hit out at Narendra Modi-led N.D.A. Government at the Centre. Leading the attack, Congress president Rahul Gandhi targets P.M. Modi by stating “chowkidar weak hai”. i.e. “The Guard Is Weak.” Using Twitter as the perfect platform, the Congress progeny open fire on other leak instances in recent times. Data leak, Aadhaar data leak, SSC exam paper leak and Election Date leak. He adds that there’s leakage in everything, with hashtag #BasEkAurSaal. Other Congress bigwigs such as Jyotiraditya Scindia and Kapil Sibal also took turns at the government over the paper leak case. While Scindia blamed the “incompetence” of the government, Sibal took a sly dig saying “Desh Badal Raha Aai”.A popular tag line previously coined by Modi which translate to “the country is changing”. 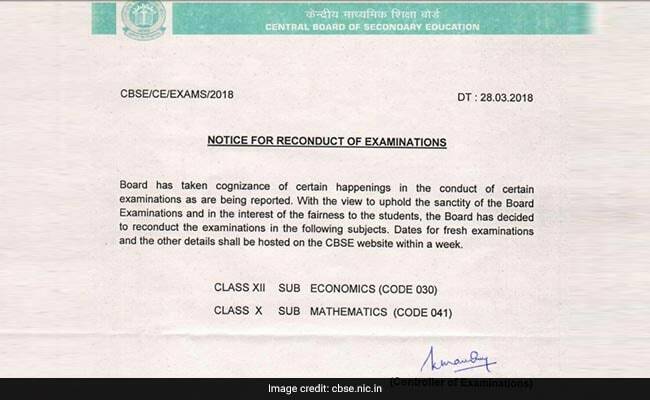 First #SSC, now #CBSE – this exam paper leak is disgraceful & unacceptable. Feel extremely sorry for the lakhs of children who are suffering & being punished because of govt incompetence. Heads must roll! Desh badal raha hai ! Delhi Deputy Chief Minister and senior A.A.P. (Aam Aadmi Party) leader Manish Sisodia also attacked the Modi government, accusing it of ruining all institutions. Meanwhile, Sisodia took to the microblogging site, alleged that the government was not able to manage any institution. डेटा लीक, एमएससी-पेपर लीक, इलेक्शन-डेट लीक, सीबीएससी-पेपर लीक…. ये केन्द्र सरकार है या लीकेज सरकार! इनसे कोई संस्थान नही सम्भल रहा। हर संस्थान को तबाह करके मानोगे? The series of attacks come a day after C.B.S.E. Announcements. The board confirms the re-conduction of Mathematics and Economics board papers of class 10 and class 12 respectively. In lieu of any other options, the leak of question papers has led to such action. Two FIRs were registered in connection with the leaks. One in class 10 paper leak and the other in class 12 paper leak. The CBSE also shared a fax it received from “unknown source” on March 23. It names a coaching institute owner in Rajinder Nagar area of Delhi and two schools in connection with the paper leak case. In its complaint to Delhi Police, the board also talked about an unaddressed envelope that CBSE received on March 26, the day class 12 Economics exam was conducted. According to the board, the envelope contained four sheets of hand-written answers of Economics paper. Meanwhile, the crime branch of Delhi Police has constituted a Special Investigation Team (SIT) to probe the case.